The Zombies are here! Ok, well maybe not. However, we did just get the new Otis Technology Zombie Gun Cleaning System last week. We’ve been waiting for this to arrive since SHOT Show in January. This is an awesome 3 gun portable kit. Full review coming soon! We plan to hit the range this weekend and this we be coming along for testing. 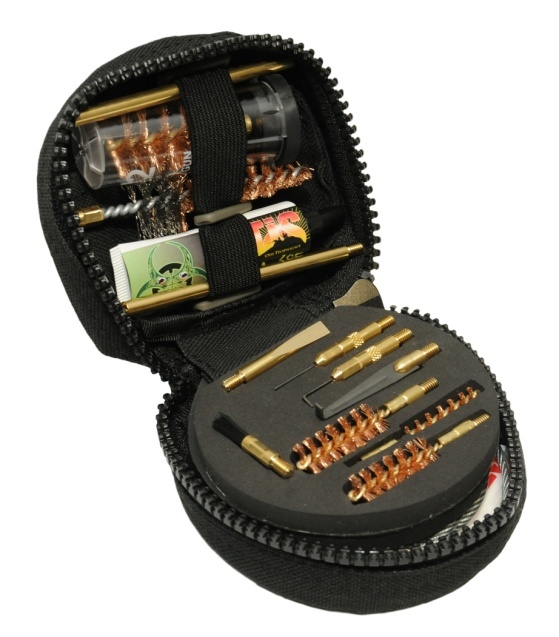 Until then check out the details about this kit made to clean rifles, handguns and even a shotgun. Otis Technology, the leading manufacturer of gun cleaning systems and accessories, has an apocalyptic survival item to add to your Zombie collection. 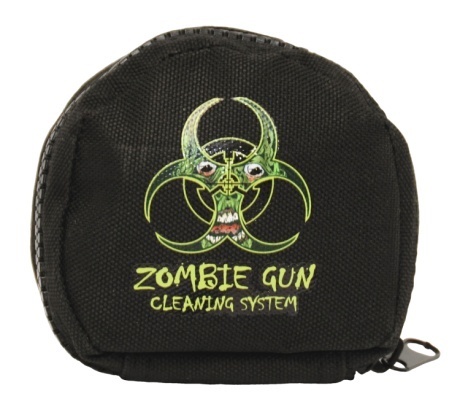 Serious Zombie hunters and enthusiasts absolutely must keep their Zombie firearms clean and properly maintained to be ready for the next attack. The new Zombie Cleaning System from Otis is designed to clean all 5.56MM rifles, 9MM and 45 caliber pistols, and 12 gauge shotguns. It includes 8” and 30” Memory Flex® Cables for effective and correct Breech-to-Muzzle® cleaning, four (4) bronze bore brushes, a rubberized patch saver® for a 360° cleaning of shotgun barrels, and specialized precision tools for a complete breakdown and fine cleaning of all critical and hard to reach areas of your firearm. A green bore reflector/flag safety, D.O.A./85 Solvent, and a limited edition Zombie labeled soft case are a few of the unique components featured in this new system. Stay tuned for the full review. Don’t forget to check out www.CarducciTactical.com for more Zombie related products and even match dates. This entry was posted in Product Reviews, Tactical Gear, Zombies and tagged gun cleaning kits, otis technologies, otis technologies gun cleaning kits, zombies. Bookmark the permalink.